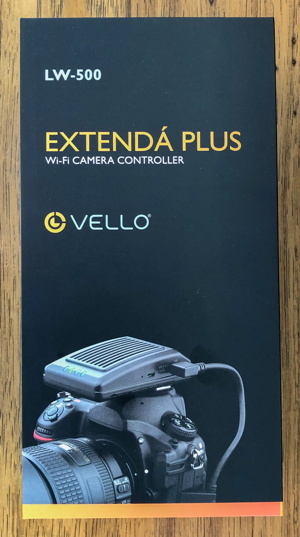 At the Consumer Electronics Show (CES) 2019 Vello announced their Extendá Plus Wi-Fi Camera Controller for Select Canon, Nikon, and Sony Cameras. 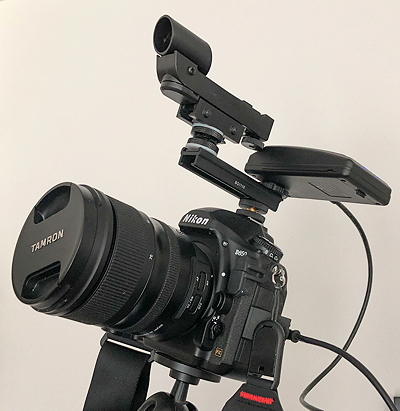 This camera controller got me excited for two reasons: ability to control my DSLRs and view live and captured photos and videos from my iPhone or iPad, and an intervalometer function. Support for Macintosh, Windows, and Android is also available. 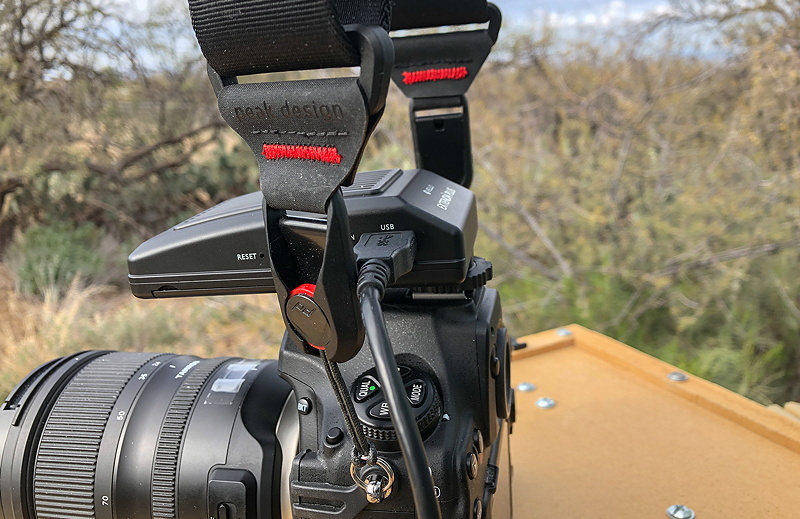 I have been using two models of the Vello Wireless ShutterBoss with my Nikon D7200 DSLR and Nikon D850 DSLR cameras for remote camera control and for the intervalometer function to take long exposures (minutes). 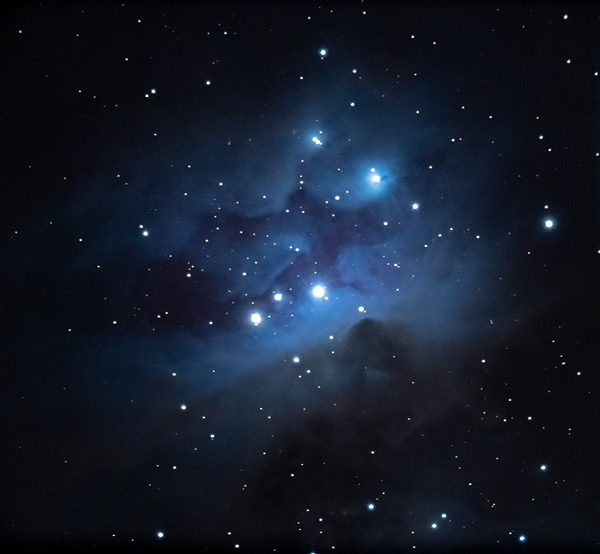 Being able to see what the camera sees from a remote screen would be very handy at times when doing astrophotography. 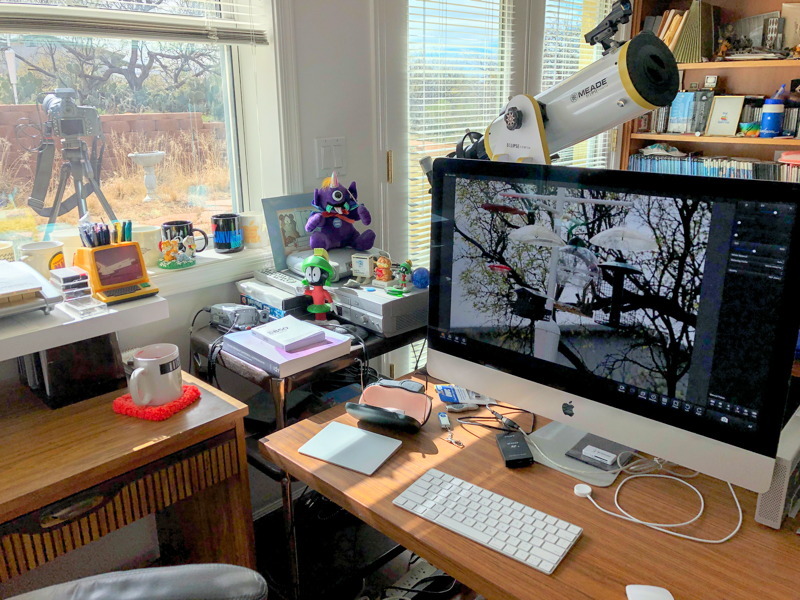 And the intervalometer function would mean that I could continue to do long exposures with my DSLR on the telescope, a sky tracker, or a camera tripod. * Use the USB cable that is supplied with the camera. Live streaming of video and video recording is not supported. I pre-ordered the Extendá Plus from B&H on 11 January 2019. This newly released product had an initial expected availability date of 16 January and was finally in-stock on 25 January. It shipped on 28 January and arrived on 31 January. I charged the Extendá Plus using the Micro-B USB cable that came with it. I tested the Extendá Plus with my D7200 DSLR (photo below left) and D850 DSLR (right below) using an iPhone 8 Plus, iPad Pro 9.7", and iMac 5K 27". 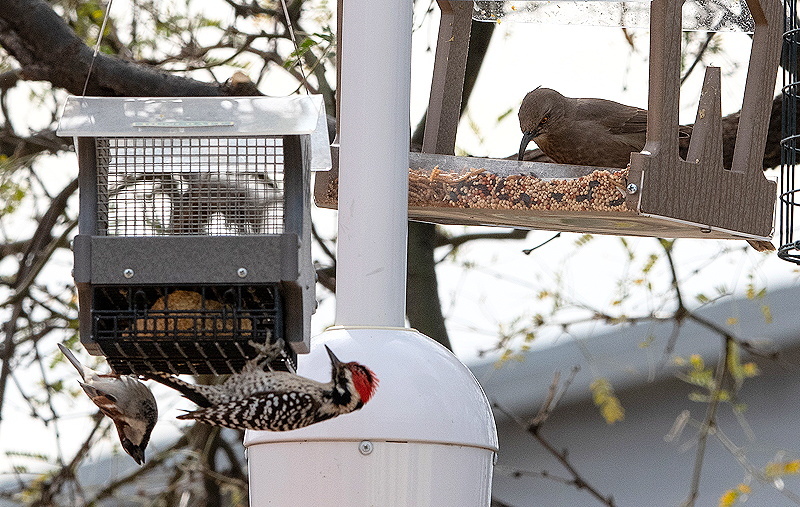 Using the Vello extension bar (seen in the photo above on the right) with my red dot finderscope and the Extendá Plus worked although it was a tight fit with both accessories. 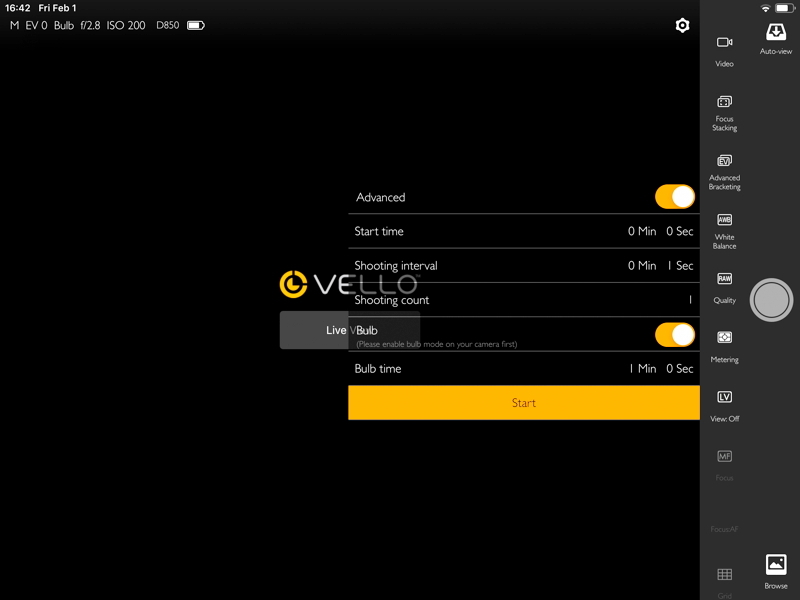 Longer extension bars are available from Vello. There was no clearance issue. The Extendá Plus USB port or cable connector could be damaged. This may or may not be a concern depending on the camera model. After the Extendá Plus is connected to the camera and both are powered ON, you connect to the Extendá Plus Wi-Fi hotspot from your device or computer Settings app. 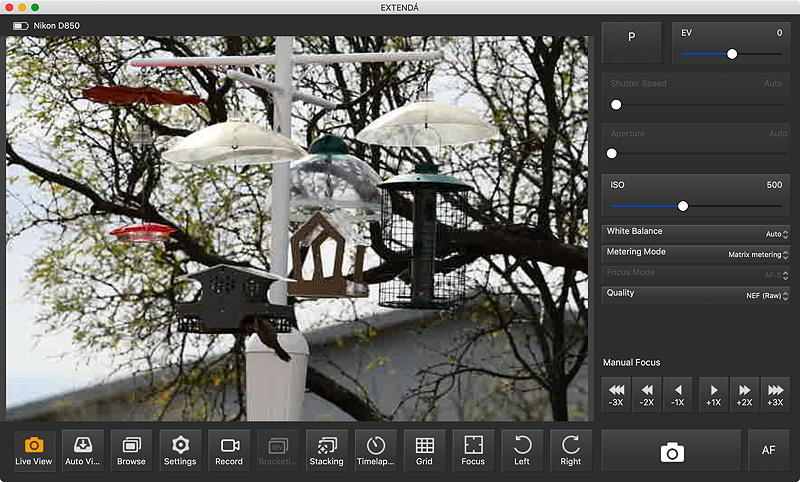 Once connected to Wi-Fi you use the Extendá Plus app on the device or computer to view and control your camera. 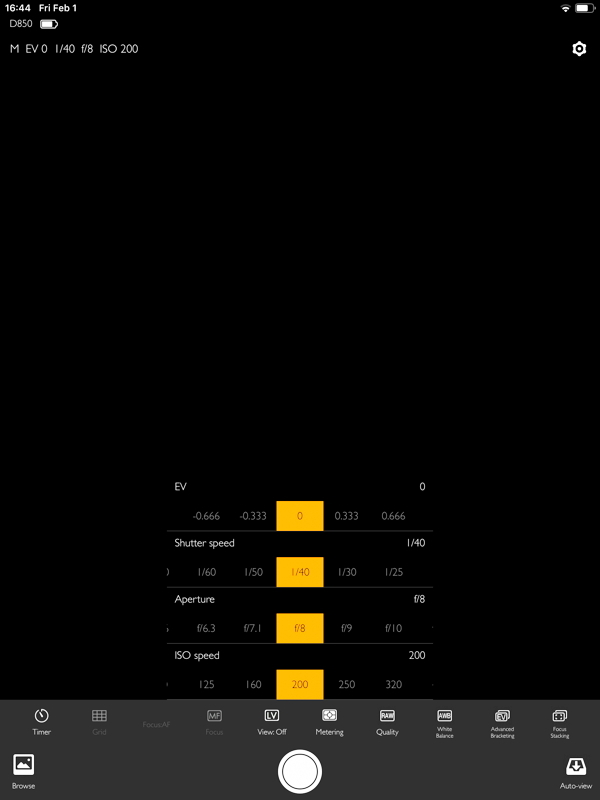 As I previously mentioned, the Intervalometer mode was important for my use (for astrophotography). 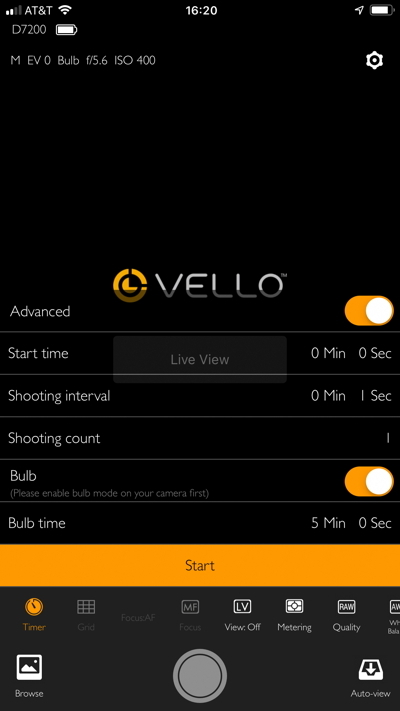 With the camera in Bulb mode you access the Intervalometer by tapping the Timer button at the bottom and then tap the Advanced toggle. Tap on the Bulb time line to adjust the duration of the exposure (or other options) as seen at the left below. Tap Done. Make any other adjustments needed and tap Start button (seen at the right). I also did some brief initial tests of the iOS app on my iPad Pro 9.7" using the D850 DSLR. Using the Apple Pencil worked with the iPad Pro app. I did have to cycle power on Extendá Plus to get its hotspot to appear on the iPad after using Extendá Plus with the Mac. But that was the only glitch I had with the iOS apps. I downloaded the free Macintosh application from the Vellogear web site (Support, then Firmware). (The Windows app is also there.) 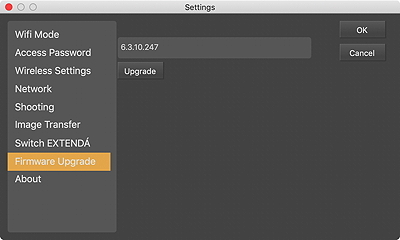 On the first launch of the Mac application I got an alert about a firmware update (left). 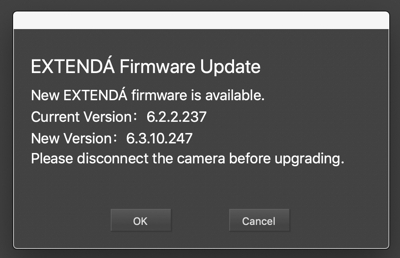 Clicking Settings and Firmware Upgrade (right) will install the update and reboot the Extendá Plus. 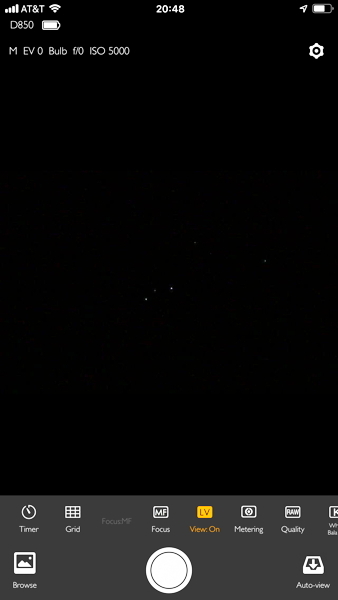 I did some 12" telescope prime focus imaging with the D850 DSLR and Extendá Plus using the iOS app on an iPhone 8 Plus. 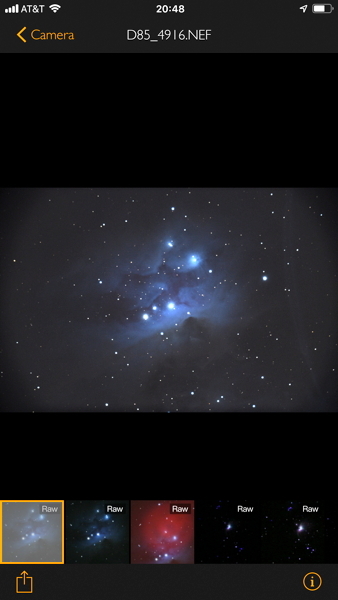 With NGC1977 (Running Man Nebula) as the target I used the iPhone with a Live View of the DSLR screen to help frame the image. 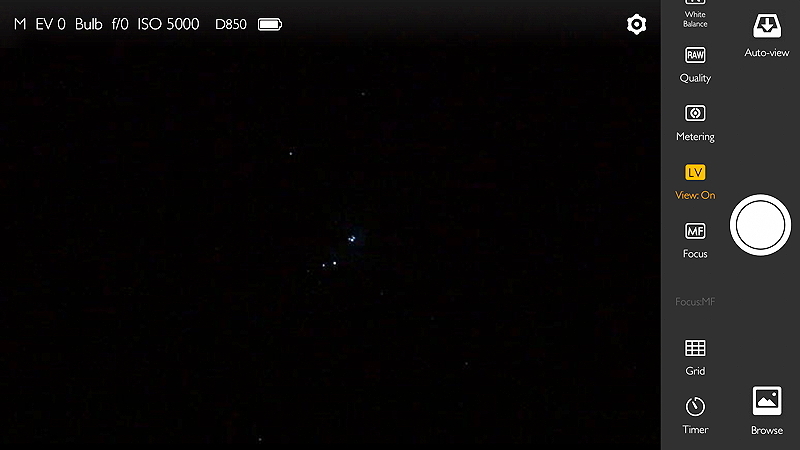 The screen capture on the left shows a Live View with three stars visible. 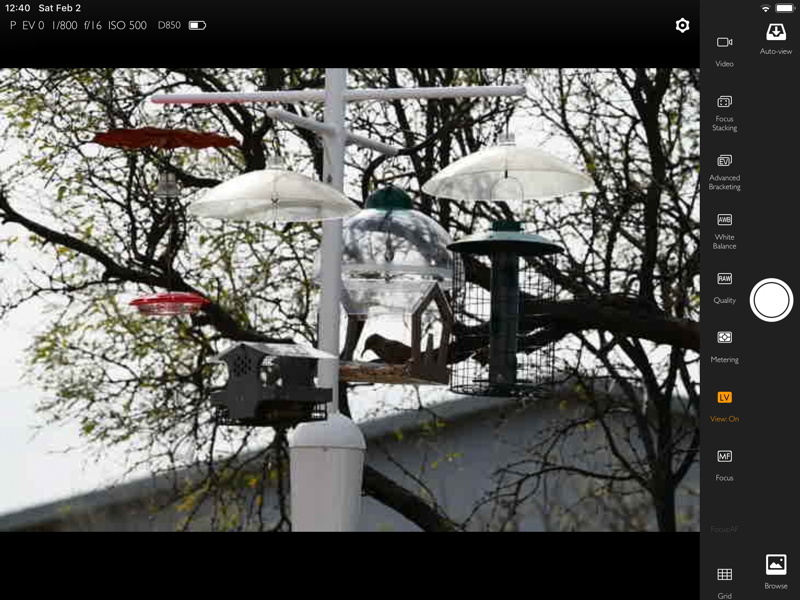 The screen capture on the right shows a 2 minute exposure photo that was on the D850. 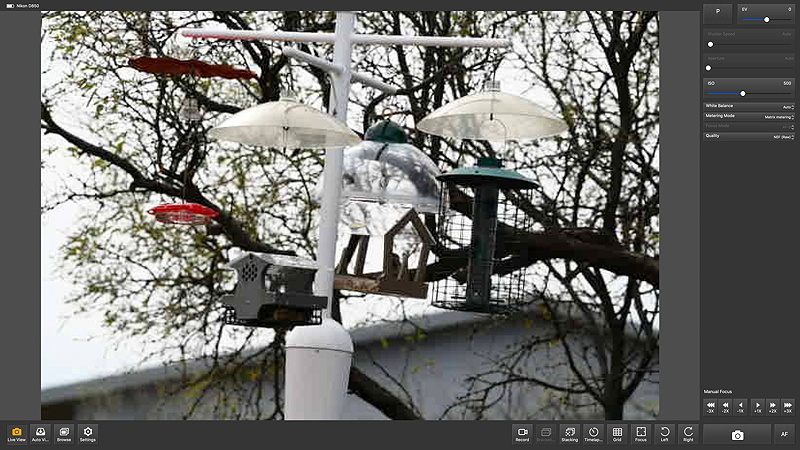 The bottom photo shows the same 2 minute exposure (slightly cropped with some image editing). 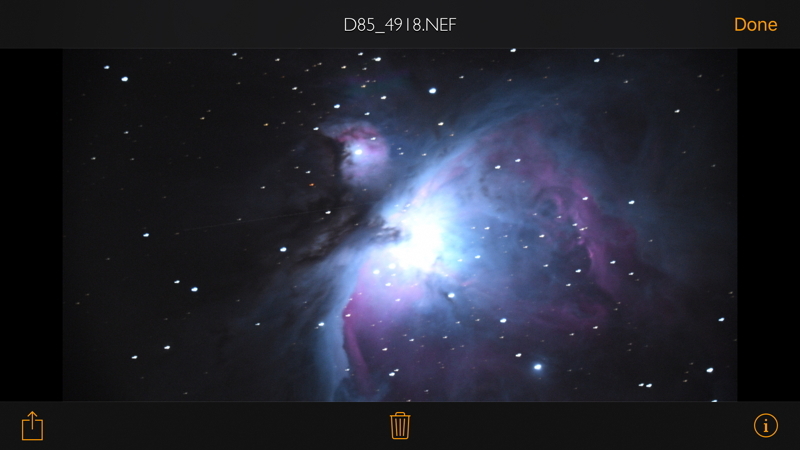 I also imaged M42 (Orion Nebula) The top photo shows the D850 Live View on the iPhone with some stars visible (including the Trapezium cluster at the center). The bottom photo shows a 1 minute exposure image (slightly trailed due to poor seeing) of the Orion Nebula as it was stored on the DSLR. Using the Extendá Plus worked for doing astrophotography. The Intervalometer mode worked once I figured out that putting the DSLR into Mirror-Up mode did not work. In this mode the mirror would be flipped up but no image would be taken. When I did not use the Mirror-Up mode the mirror would be flipped up and the exposure started almost immediately. I did discover that I could set a Start time delay in the app which flipped the mirror up and then waited for the specified number of seconds to pass before starting the exposure. This delay allowed any vibrations from the moving mirror to dampen out. 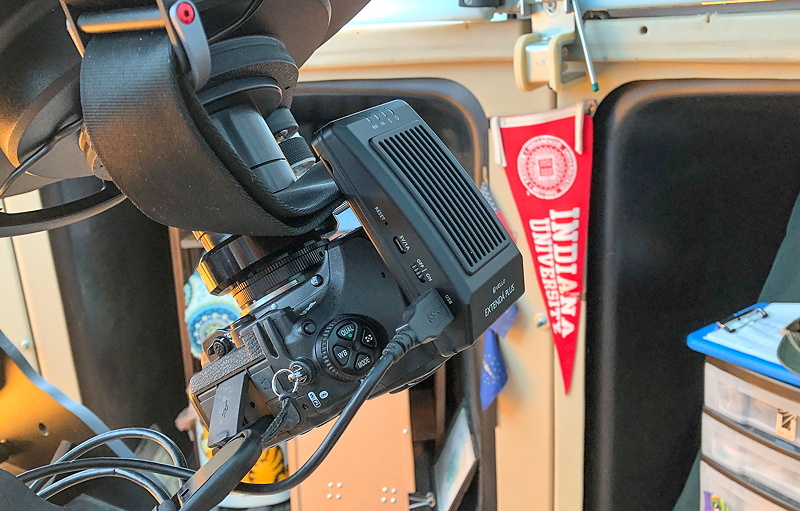 Even though browsing camera images is fast due to the 5 GHz Wi-Fi connection, I frequently turned off the Extendá Plus so that I could view the captured images directly on the camera to check framing and exposures. That is not a drawback of the Extendá Plus, but just my personal preference. The LEDs on the Extendá Plus are somewhat bright for use at a dark site. I may place some red lens tape over the LEDs. 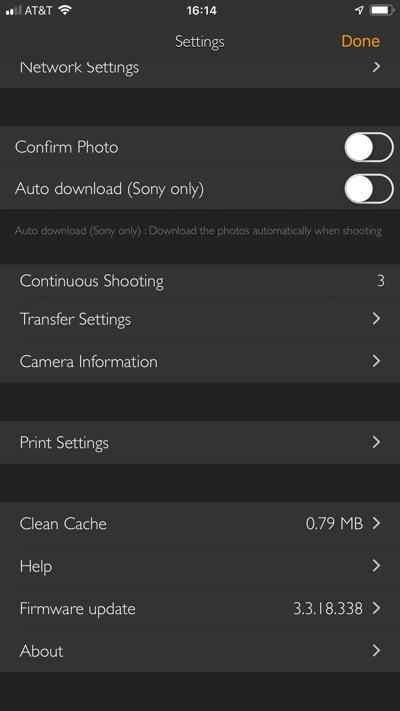 There are many add-on devices available for control camera. 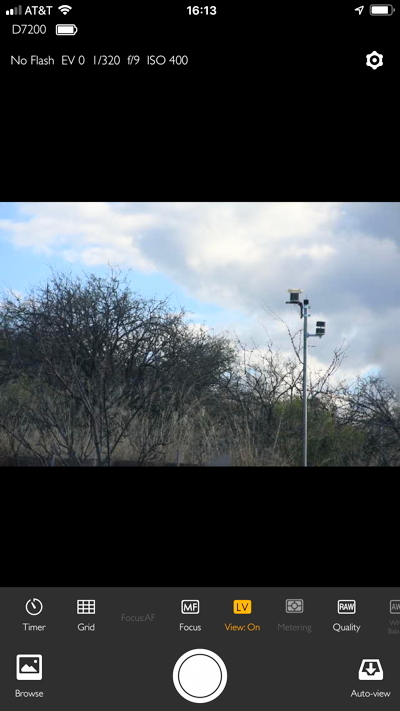 There is even software for some models that provide live view and photo capturing. 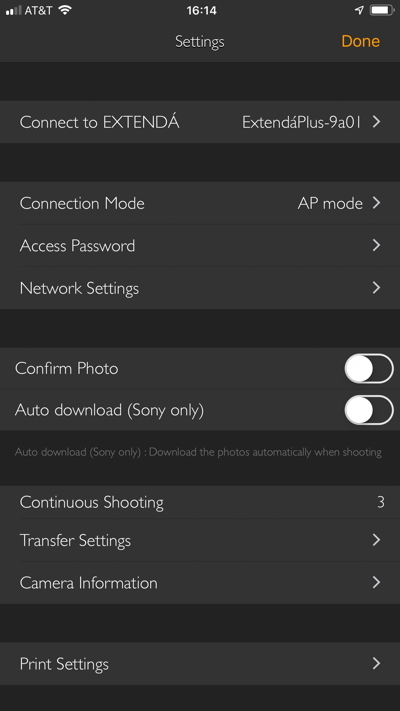 I have used the Nikon iOS apps "WMU" and "SnapBridge". 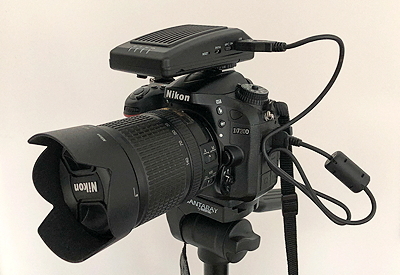 WMU worked fine with the D7200 DSLR, but SnapBridge for the D850 DSLR was unreliable. 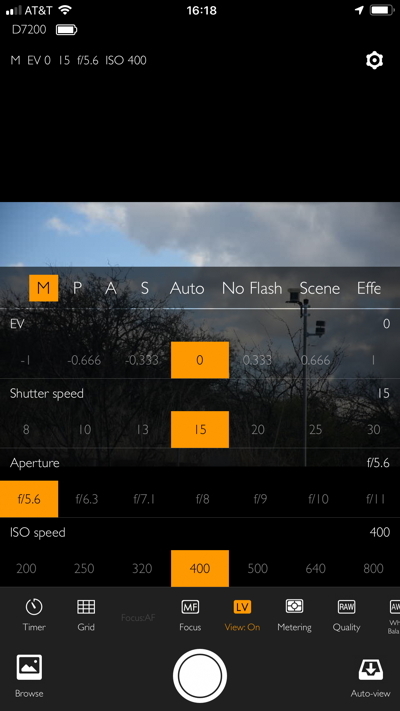 Neither app worked with the other camera and they did not have an intervalometer function. The Vello Extendá Plus apps worked as I hoped. 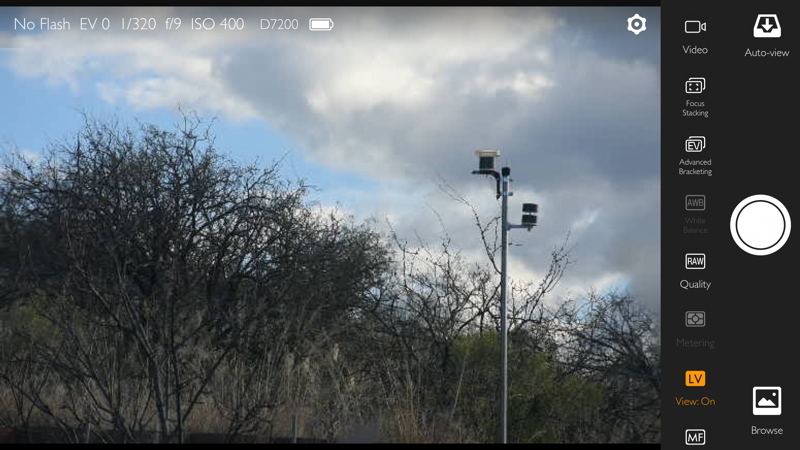 The only thing that somewhat surprised me was the image quality of the live view seen on the 27" computer screen when it was upscaled from the native size from the camera. Some pixelation was evident. The only time when this could be an issue is during critical focusing. I expect I will continue to use the Vello ShutterBoss when imaging through a telescope. 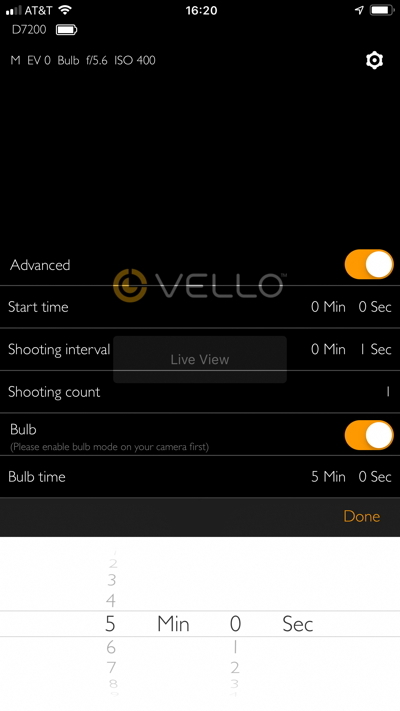 I will probably use the Vello Extendá Plus when doing general photography with the DSLR on a camera tripod and astrophotography with the camera on a sky tracking mount. The Extendá Plus really shines when wanting to see a Live View on the iPad or iPhone, set exposure values remotely, and/or take photos that you want to immediately download from the camera and share with others. 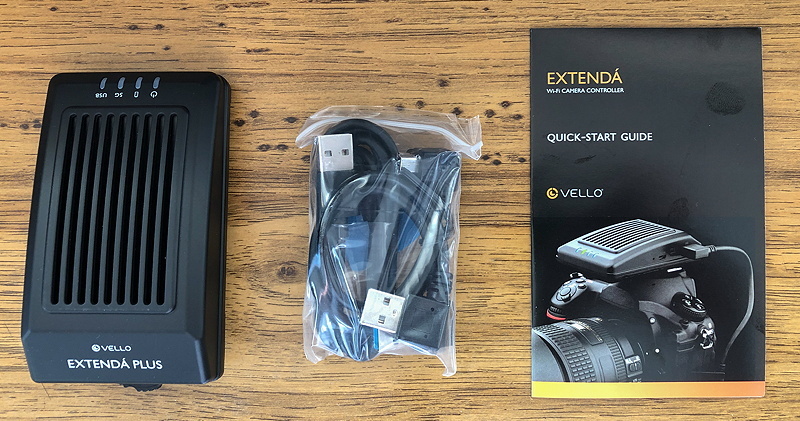 I have been very happy with my Vello products and their support over the years so choosing the Vello Extendá Plus was a good decision. To learn more about the Extendá Plus, the Vello product page has the Quick-start Guide and more detailed User Manual online.